People have come up with some creative answers to the question: “What do I want done with my remains after I die?” Some want their ashes blasted into space. Others want to be scattered to the wind from the prow of a ship. Some have their remains made into a pod that will grow into a tree if planted; others have their ashes melted into glass sculptures or infused into ink used to tattoo a loved one. There’s always the traditional route; embalming and conventional burial. None of these were right for Altoona resident Lloyd Shepherd, who is working to open a natural burial cemetery in the Chippewa Valley. 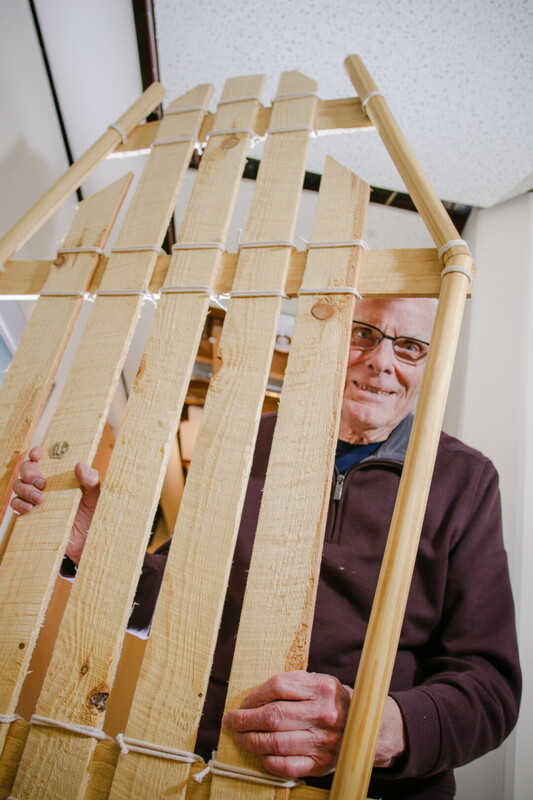 Lloyd Shepherd built a pallet that he wants to be used during his own burial. He hopes to create a “green” cemetery in the Chippewa Valley. Shepherd had considered cremation, but being an environmentally conscious man, had concerns about the use of fossil fuels to do the job: Incineration can use more than 20 gallons of LP. He convinced his son and grandson to join him on a trip to Natural Path Sanctuary, a “green” cemetery in Verona, Wisconsin. At the open house, Shepherd learned about the natural burial process, which forgoes embalming and caskets in favor of decomposition. People who choose a green burial are wrapped in a shroud and lowered into the ground on a pallet made of natural materials. They are buried in graves that average 3-4 feet deep, allowing for adequate oxygen access to help break down the natural tissues while providing sufficient protection against animal disturbance. Natural graveyards are designed to make as small an impact on the land as possible. Trees, grasses, and other plants are allowed to grow where they will. Markers, if allowed, are kept small and lay flat on the ground, rather than protruding as a headstone does. “I became convinced that that’s what I wanted for myself, and as I looked into it I thought that a natural cemetery would be an asset to this area,” Shepherd said. Shepherd is working with friends and fellow members of his church to form a cemetery association and find funding to purchase land for the project. They will need 20-30 acres on relatively flat land. A number of other technical requirements regarding soil composition and groundwater presence factor into the decision of where to establish the graveyard. “I’ve had really positive responses whenever I talk to people about the idea,” Shepherd said. He expects the project would serve eight counties surrounding the Chippewa Valley, giving people an environmentally conscious burial option. More information on green burial can be found online at greenburialcouncil.com.